A devastating fungal disease that has killed millions of bats in eastern North America has now reached Washington State, prompting serious concern among wildlife officials. It has been referred to as the worst US wildlife crisis in recent years. Since 2007, this blight—known as white-nose syndrome (WNS)—has spread to 28 U.S. states and five Canadian provinces, killing an estimated 5.7 million to 6.7 million bats in the process, most of them little brown bats (Myotis lucifugus). In some regions, losses have exceeded 98 percent of local populations. Until now, this point the disease has been relegated to the eastern half of North America, but it now appears that it’s made a rather big jump to the other side. The fungal disease was detected in North Bend, Washington, which is about 30 miles (48 km) east of Seattle. It’s the first time that WNS has been detected in the western United States. 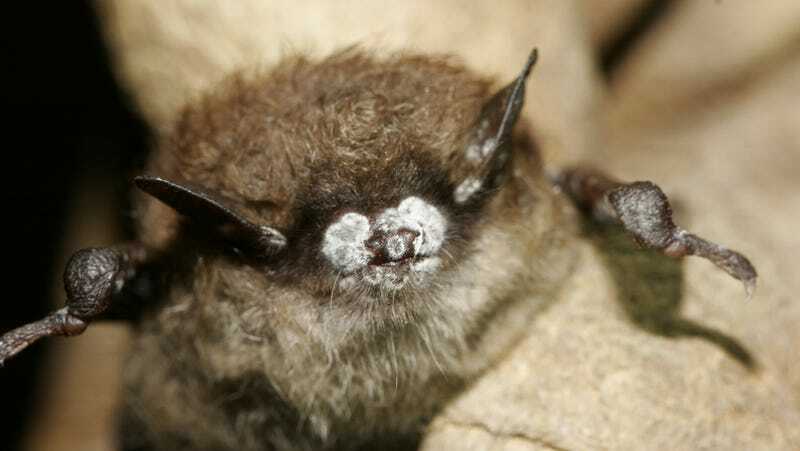 The disease causes a fuzzy white fungus to grow on the faces and wings of hibernating bats. This growth makes the bats repeatedly wake from their slumber, which causes them to burn through their fat stores, resulting in starvation and often death. Bat Conservation International said this is “a dire wakeup call” as experts expect the disease to spread from this new viral epicenter. Given the presence of the virus in the west, conservationists are under added pressure to have the bat listed under the Endangered Species Act. This status, which would afford the ecologically-critical species special protections, is currently under review by the U.S. Fish and Wildlife Service. Earlier this months, scientists discovered that bats in Asia are resistant to WNS.